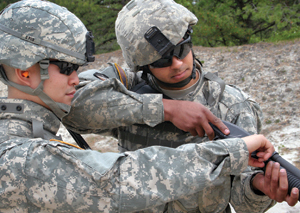 Range officer 2nd Lt. Kevin Kuo, left, visually inspects the weapon of Spc. Douglas Hinds weapon during the 1-114 Infantry live-fire exercise on the Joint Base McGuire-Dix-Lakehurst's shotgun range. For military decision-makers, managing the details of a battalion at war can quickly become like counting grains of sand in a sandstorm. In war, a flat tire changes plans, communications, intelligence reports, supply chains. And each second that passes exposes warriors on the battlefield to danger. Col. Thomas Hallowell is the leader of the team that teaches units how to keep the sand out of their eyes. As director of simulations for the Battle Command Group (BCG) section at the Joint Training and Training Development Center (JT2DC), Hallowell leads a team of experienced Soldiers who help train battalion staff on the art and science of controlling chaos. During a BCG Simulation Exercise held at the JT2DC on June 11, the battalion staff conducted a capstone exercise that began six months ago for the senior staff of the 1st Battalion, 114th Infantry. While Soldiers in the field trained on firing high explosive M203 grenades, the 1-114th tactical operations center trained on the details that make them a more effective nerve center for the unit. 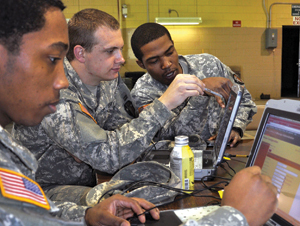 Hallowell said the primary goal of the exercise is increasing the unit's proficiency at information management. "Communications has to go up, sideways and down," Hallowell said. "I'm going to ask them a million times, 'Who else needs to know?' "
This training is not unique to New Jersey. Large scale training operations like this are routinely conducted at places such as the National Training Center at Fort Irwin, Calif., or the Joint Readiness Training Center in Fort Polk, La. But these exercises cost millions of dollars and take years to prepare. However the simulation exercises at the JT2DC costs nothing more than the regular cost of a unit's monthly battle assembly, Hallowell said. This approach allows the units that train with the BCG to work on the often-grueling methodology of the Military Decision Making Process in an environment that encourages creative thinking and cooperation. The cost-effectiveness and improved outcomes the BCG has achieved have led to partnerships with organizations outside of the military, Hallowell explained. Civilian Law enforcement have used the resources at the BCG to train on hostage situations; school districts have trained on how to handle shooting incidents; and plans are being developed to model Super Bowl operations at the Meadowlands Sports Complex. Though this one-of-a-kind facility sets the bar for training simulations in the Army, Hallowell shared his urgency to always seek new ways to make the training more effective during his tenure as director. "These are not just little icons on the screens. They're Soldiers," he said. Each of the fatalities he experience while deployed remain tattooed at the front of his mind, he said. "If I'm leading a battalion of Soldiers I can help 700," Hallowell said. "But if I can push through a battalion of Soldiers a quarter while I'm here, I can help thousands."